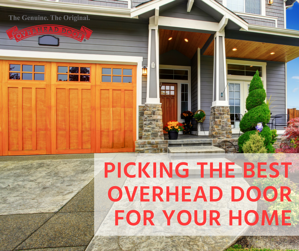 Picking the right Overhead Door might not seem like such a difficult task until it comes time to make that decision. If you think about it, the Overhead Door is the unsung hero of the house, providing not only safety and security to your house and family but aesthetic elegance that separates your house from the rest in the neighborhood. Although selecting the right overhead door from so many different styles can be overwhelming, here is some helpful advice that can you help you decide which style works best for you, and why. Feel free to contact us to discuss our overhead door options in more detail! These garage doors come in many different architectural styles. One of the greatest benefits of these wood-grain fiberglass doors is that they portray the natural beauty and fine detail of natural wood without all the upkeep of having natural wood. If you are going for a classic look that will never go out of style, these are the garage doors for you. The doors come either in either natural or unfinished wood. These doors, unlike the Impression fiberglass, will require a bit more upkeep, but we offer the option to receive the doors already primed. These doors are not only thermally efficient with an R-value of 12.12, but they look just like carriage house doors, only more durable than traditional carriage house doors, as they are made from two layers of steel and insulated with polyurethane. These garage doors not only offer old-world charm with new-world elegance, but they are as durable as garage doors get. They will protect your home and family from most acts of God, chiefly, hurricanes, high wind damage, pressure damage, and wind-borne debris. If you are on a budget, these garage doors are not only pleasing to the eye, but they have stood the test of time, and will do the same for you. Both durable and economically reasonable, these garage doors are made of the best steel and will give your home a classic look, thanks to the clean lines and the understated yet classic design. Overhead Door of San Angelo™ will provide you with the durability and the aesthetic look you have in mind. Please reach out to us so we can make sure that you have the peace of mind that your home is not only the prettiest but the safest home in town. We have more than ninety years of innovation and excellence and would love to talk to you more about the benefits and drawbacks of selecting the garage door of your dreams.